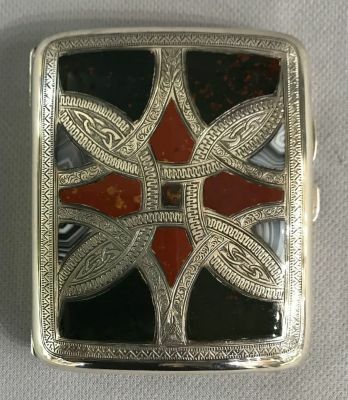 Antique Scottish pebble hardstone cigarette case. Sterling silver case hallmarked Birmingham 1902, made by Joseph Cook & Son. Inlaid with carnelian, grey banded agate and bloodstone. Engraved on the back JDR, 12-6-15. The case was presented to Mr. John Drysdale Robb on his wedding day in 1915. A copy of the wedding invitation is with the cigarette case. 3 3/8” by 2 7/8”, 3/4” thick.